This home is set up for the large family or a family in need of ground floor living area.The home has 4018 sq. 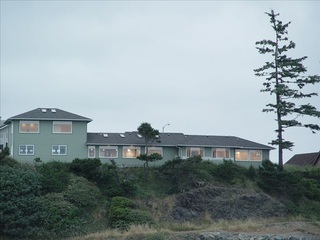 ft. & has 4 bedrooms & 5 baths & floor to ceiling windows to enjoy the majestic Pacific ocean. The 3rd floor is set up as a loft library while the main living is on the second floor.Every room has a view! It has a 3 car garage & plenty of parking for any visitors you may have.There are 3 types of heat, 2 hot water heaters & a outside shower for sand wash down.Easy to see! Oceanfront....almost! Unobstructed, breathtaking ocean and island views! This magnificent custom built home features 4 spacious suites, 2 upstairs & 2 down. Main Master bedroom has fireplace w/private parlor located on 2nd floor. Custom winding staircase. Large family room w/wet bar has big picture windows. Amazing ocean & coastline views! Original home built in 1957 & complete renovation in 1996. Floor to ceiling windows. Crow's Nest offers 360 degree views, currently used as private office. Must See!! Some LUCKY person is going to steal this home at the price it cost to build, 8 years ago. So what are you waiting for? This is a HUGE PRICE REDUCTION!! 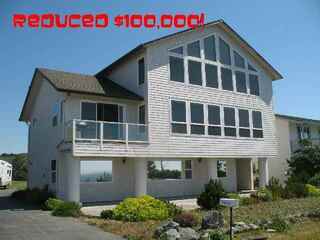 Reduced $150,000! Seller has made a "Contingent Offer" on another home and must SELL quickly. This is truly an AMAZING Low Price for this Spectacular Ocean View Home! 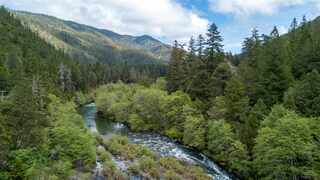 Smith River front Paradise, private and secluded! Spectacular off grid home on approx. 20 acres built to maximize views of the South Fork's emerald waters from every perspective.Uniquely designed with state of the art solar power and generator back-up. Outdoor kitchen with all the amenities, hot water, bbq, fire pit. Detached carport has 2 large storage areas & solar equipment is housed in separate structure. ALL Structures have copper roof. Fantastic OCEAN FRONT 4 bed, (2 master suites) 3 ba. custom at the ocean's edge! Lighthouse 2 Point St. George panoramic views, wall of windows, travertine floors, vaulted ceilings, Chef's kitchen, Brazilian Cherry cabinets, SS appliances, granite counters, great room, 2 propane fireplaces, 2 heat pumps, custom tile, jetted tub, walk in shower. Upstairs master suite w/fireplace. Cement siding-50 yr roof.Engineered pier to bedrock foundation. Pre-qualified buyers only please. Listing agent is part owner. Resting on 1.81 acre site surrounded by beautiful easy care grounds, this SPECTACULAR single-level oceanfront home is a form of paradise. Its light, bright, and very open floor-plan offers gorgeous OCEAN views from nearly every room. One of few lots with room to built a guest home or shop. Located in a GATED community known as "The Beach" Subdivision with several deeded accesses to the shore. Enjoy the BANANA BELT temperatures and proximity to Oregon border. $20k flooring allowance. 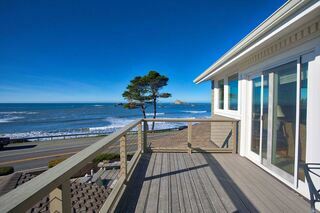 Spectacular and unobstructed views of the Pacific Ocean. No expense was spared in the construction of this legendary home. The finest wood imported from S. America, travertine heated tile flooring, and panoramic views from most rooms. An amazing wine cellar greets you in the downstairs media room for all your entertainment needs. The patio offers a breath-taking view of the lighthouse and 150 degrees of rocky coast line. $10,000 bonus to buyers agent with successful offer. BREATHTAKING VIEWS of the mighty Pacific Ocean, Prince Island, city lights of Brookings and dramatic coastline with miles of sandy beach. Enjoy the ocean BREEZES and sounds of crashing waves. EXQUISITE home with 4 bedrooms, 3 baths, vaulted ceiling and skylight in living room, gourmet kitchen with SS appliances, GRANITE counters, beautiful cabinets, plus travertine floors throughout most of home. B/I vacuum, recirculating hot water and more! The Beach Subdivision is a gated Oceanfront community. Amazing property with tons of privacy on 26 acres in a secluded setting. Multiple uses, just look at the photos and use your imagination. A 14 car garage is attached, with 4 other outbuildings, including a 4,800 sqf. shop, a 3,360 sqf shop, and a 960 sqf. shop. All have heat and dehumidifiers. A gated private road leads you to the center of the compound, where a 3 bed, 2 bath home anchors this unique property. Less than 2 miles from town, yet feels like a million. Cars, horses, trucks, or small business? Perched on Spyglass with a commanding, panoramic view of Pt. St. George to the south and across the expanse of Pelican Bay, to the precipice of Brookings/Harbor to the north, is "WaterStone". This lovingly and artfully designed home was constructed to assimilate into and draw it's strength from the wealth of natural beauty that is "The Wild Rivers Coast"! An eye for detail, captures this unequaled site from the walking trails that traverse the property to the cobble-stoned courtyard, Water-Stone beckons. Page rendered in ~0.117 seconds using 1.7 MB of memory.